A number of commemorative events were organized in Moscow to mark the 70th anniversary of the meeting on the Elbe River between Soviet and American soldiers, including a historical re-enactment in the nearby city of Noginsk and a conference devoted to discussion of Russian-U.S. cooperation then and now, featuring the participation of U.S. Ambassador to Russia John Tefft. The celebrations took place amid statements made by participants on both sides on the importance of cooperation, despite current disputes. The Moscow Region city of Noginsk celebrated the recent anniversary of the meeting on the Elbe River between Soviet and American soldiers in 1945 by holding a festival entitled “Let Us Remember.” Part of a number of commemorative events organized in Moscow, the festival on April 25-26 included a historical re-enactment of the famous meeting on the Elbe, as well as a teleconference with the German city of Torgau, where the legendary event took place. According to organizers and guests of the festival, the emphasis was placed on the importance of the common efforts made by the Allies in their fight against Nazism. The meeting on the Elbe, they said, is of particular importance today, when relations between Russia and the West are in the deep freeze, having reached their most strained since the fall of the USSR. “History is important to us, because it teaches us lessons. The lesson of these events is that, despite some specific disagreements and disputes, we must work together to solve global problems, and united on an equal footing, go forward,” noted Alexei Mazur, historian and member of the Moscow Region Duma, during the opening ceremonies of the festival. According to the festival organizers, Noginsk was chosen because the terrain along the river that runs through the city – the Klyazma River – is similar to that found in Torgau on the banks of the Elbe River. 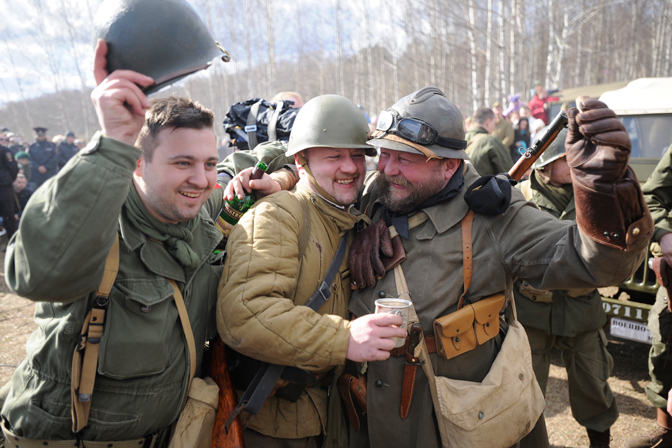 According to the organizers, the event was also a tribute to the heroism of Noginsk residents during the war – to those who fought on the front, and to those who worked for the victory in the rear. The main part of the festival was a re-enactment of the events of 70 years ago. These were acted out by several dozen people, dressed in period uniforms. They re-enacted a small battle scene between the advancing Soviet troops and the defending Nazis, complete with loud shooting and simulated artillery fire. Then they reconstructed the very meeting of the Allied forces – the “Soviet” soldiers crossed the river, and on the other side met with the “American” troops. A similar re-enactment was also held at the place of the actual meeting of Allied soldiers – in the German town of Torgau. This was preceded by a teleconference organized between the landing on the Elbe River – near the area, where on the girders of a destroyed bridge, that symbolic meeting took place – and the festival in Noginsk. Among the participants were Russian veterans that took part in those events, and who recalled their feelings in those past days. There were no American veterans present at either re-enactment. “Our differences ... [back then] were objectively much greater than they are now, but we were able to develop a pragmatic approach to cooperation, which not only helped our individual national interests, but also changed the course of history,” said the former ambassador, stressing the possibility and the desirability of changing the current atmosphere in Russian-American relations.